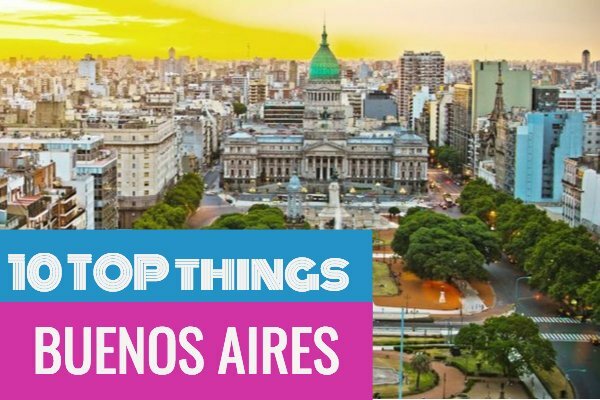 If you are planning a trip to Buenos Aires, be reminded that this is one of the biggest and most fascinating cities in the world. When planning what to do and what to see in this large metropolis, you’ll find a long list of tourist attractions, famous places and points of interest. 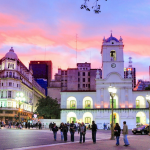 There really isn’t any best time to visit Buenos Aires, although it’s probably better to avoid January and February, as many sights may be closed for the summer. As for where to stay, the best neighborhoods are perhaps Recoleta or Palermo, which are the center of the fun things to do in the city. Here are some of the coolest must sees in the city. As you’ll probably notice, there are activities for all tastes! Plaza de Mayo is one of the most important spots in the city. 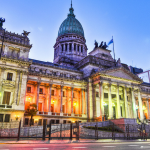 It is located just outside Casa Rosada, (literally “pink house”), where the Argentine president works. This is where protesters usually gather for demonstrations, and where Juan Perón and first lady Evita have spoken to the people. Here you can also find the National Cathedral, where the remains of national hero San Martin rest in peace, as well as the Cabildo, relevant during the 1810 May Revolution. If looking for a place to shop, you can take a stroll along Florida street, located nearby. Guided tours in English for Casa Rosada are free and are available Saturdays, Sundays and holidays at 12:30 and 2:30 pm. This green-domed palace was built in 1906 after the Capitol Building in Washington, DC. To get there you can take a 15-minute walk along Avenida de Mayo from Plaza de Mayo. On the way, you’ll be able to see people coming and going, in one the of the busiest areas of Buenos Aires on a weekday. Major spots include Café Tortoni (see historic cafés) and Barolo Palace, one of the oldest buildings in the area. Walking through Avenida de Mayo you’ll get the chance to cross 9 de Julio Avenue, one of the widest in the world, from where you can take a glimpse of the Obelisk to the right. You can later walk towards this iconic monument and walk around Corrientes Avenue, a street full of theaters, bookshops and pizza parlors. One of the most visited museums in Buenos Aires Is the Museum of Latin American Art (MALBA). Privately owned and located in Palermo, this museum is a modern building which mainly hosts Latin American collections, including Frida Kahlo, Antonio Berni and Diego Rivera. It opens every day from noon to 8 pm except on Tuesdays, and Wednesdays the ticket is half priced. If looking for something more classic, both in content and architecture, you should visit the National Museum of Fine Arts in Recoleta, where you can find works by Van Gogh, Degas, Monet, Picasso and many others. Entrance is free and it’s open Tuesdays through Fridays from 12:30 to 8:30 pm and on weekends from 9:30 am to 8:30 pm. Buenos Aires is filled with cafés. Mostly everywhere in the city, specially near busy areas, you will find coffee venues, where porteños have business or social meetings. Many of these cafés are very traditional, having become Historic Cafés of Buenos Aires. Located on Avenida de Mayo and founded in 1858, the most famous of them is Tortoni. The local version of hot chocolate called submarino (literally, submarine, as you immerse a piece of chocolate into hot milk), and the local pastry churro is a must here! The most famous theatre in Buenos Aires is the Colon Theatre. Founded in 1857, it is actually an internationally well-known opera house, which hosts symphonies by famous orchestras, as well as operas and ballets, including word class performers, such as Stravinsky and Pavarotti. It is seven-story-high European-style majestic building, worth visiting even if not seeing a performance. Guided tours are available every day (except on some specific holidays) from 9 am to 5 pm every 15 minutes. This is the second top cemetery in the world to visit, just after Pere Lachaise in Paris. Full of ornate mausoleums, it’s not just any cemetery, but the resting place for important historic figures of Argentina, the most famous probably being local political icon Evita Perón. You can visit from 7 am to 6 pm, with tours in English available on Tuesday and Thursday mornings, except if it rains. Admission is free. A visit to the church Basilica de Nuestra Señora del Pilar next door is also recommended, also free of charge. Puerto Madero is located near the city center, and it extends further back into La Plata river basin. In this neighborhood you will find both the highest skyscrapers as well as one of the largest green areas in the city. It is an area worth walking around, as you will find beautiful landscapes of the dykes in the port as well as the Woman Bridge, by celebrated Spanish architect Santiago Calatrava. You will surely notice that all of the street names in Puerto Madero are female names, after famous women in Argentine history. The most expensive yet prestigious restaurants (especially parrillas) are located in this area, all along the bay. Further back, you can walk along the river coast or even visit the Ecological Reserve, a natural 350 ha green area filled with local wildlife, where you can do some trekking, jogging or cycling. Located next to the city center, San Telmo is a neighborhood where you can take a glimpse of an early Buenos Aires, with smaller streets and older architecture, as some colonial houses still stand. There are major historical hotspots to see, such as Zanjón the Granados and Manzana de las Luces, two major archeological finds, where you can go through underground tunnels and take a look at ancient artifacts. Check the websites for guided tours! San Telmo is also well known for its antiques and art work, and for the San Telmo Market, located along Defensa street. On the weekends, this area is usually crowded, as Dorrego Square gets packed with people having drinks and enjoying tango shows in the afternoon. A visit to traditional restaurant El Federal, which opened its doors in 1864, is a must for all travelers. La Boca is typically associated with immigrants, as the port where most second-class Europeans entered the city at the end of the XIXth century is located here. Famous for its picturesque streets, Caminito is filled with music and colored walls, as well as traditional tango shows and restaurants serving good steaks. It is advisable to stay on the touristic path, as it can be a dangerous area. 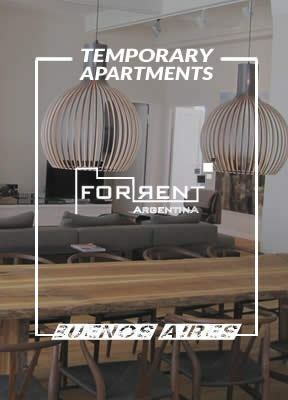 In this neighborhood you can also visit the Bombonera stadium and the Boca Juniors museum, especially if you are a football fan! 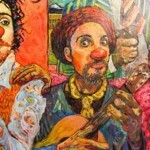 The best time to go to La Boca is on the weekend. The 3 de Febrero park is one of the largest green areas of the city and it is located in Palermo. Its major landmarks include the Rosedal, the Planetarium, the Floralis Generica, and the Japanese Garden. You can also visit the Botanical Garden, a beautiful stroll in the middle of Palermo, containing 5000 species of plants from all over the world and a 100-year-old greenhouse imported from France. You can also visit the Hippodrome and bet on one of your favorite horses. You’ll be surely delighted by the French architecture and a good time in the casino! Many more best places to visit! There are many more things to see in Buenos Aires. This is just a short list of the many experiences you can have in Buenos Aires. You will surely discover its vibrant nightlife and exquisite cuisine as major attractions all around the city. People are usually very friendly and eager to engage in conversation with tourists and practice a little English. Hopefully, you’ll find many more things as you explore this wonderful city and as you decide it’s worth visiting many more times!